*Update October 2017: The island of Dominica was hit by a category 5 storm, Hurricane Maria, in September of 2017. The information on this blog reflects life in Dominica prior to Hurricane Maria. This blog site is no longer being updated regularly. Some of the beach establishments below are closed, being repaired or are no longer in business. Please call before heading out to visit them. To contact the author with any changes, please email louisiana2dominica@gmail.com or comment below. Thank you! 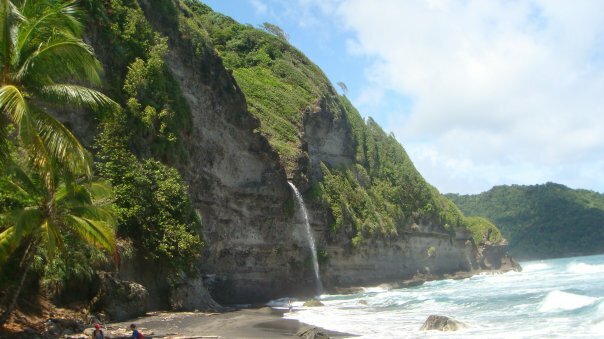 There are lots of beaches to explore in Dominica and they are each unique in their own way. So before you head out, think about what you are looking for. If you want calm water and snorkeling, stick to the West coast, the Caribbean Sea side of the island. If you want to watch big waves roll in, head over to the East coast, the Atlantic Ocean side of the island. Some of the beaches have black volcanic sand and others have golden colored sand. Some of the beaches are rocky making it hard for children to enter the water. Some beaches stretch out with plenty of sand for lounging, relaxing, and sports. Don’t assume that the beach you want to go to has a public restroom or a place to purchase drinks/food. Pack everything you are going to need from water and snacks to sunscreen and toilet paper. When going to the beaches on the northern part of the island, bring a local with you or someone who knows the area well. Some of the entrance trails to the beaches are hidden and may be hard to find. It is recommended that you go with a group of people. Do not leave your belongings unattended. Batalie Beach / Sunset Bay Beach Club & Resort (West coast; Coulibistre, Caribbean Sea) – snorkel site; bathroom and restaurant on site; small fee for use of lounge chairs and pool. Batibou Beach (North coast; near Calibishe, Atlantic Ocean) – part of Pirates of the Caribbean was filmed on this beach. Lots of sand, easy to enter the water. You can get to Batibou by boat or by hike. This beach is also referred to as “Hampstead Beach” because it is situated on the Hampstead Estate. Take a local with you. Coconuts Beach & Ti Bay (North west coast; Picard, Caribbean Sea) – walk down past RUH/La Flambeau restaurant. If you keep walking, you see an orange building and part of what used to be Coconut Beach Hotel. There is a permanent barge docked out front. You can do a small amount of snorkeling there. If you keep walking till where the beach ends you will arrive at Ti Bay. Great snorkeling at Ti Bay beyond the rock jetty. Kid friendly beach but no bathroom/vendors on site. Champagne Beach (South west coast, past Roseau, Point Michel, Caribbean Sea) Beach is rocky, not much area for kids to play. There is a bathroom/snacket/shower available at Irie Safari on site. Irie is not always open though. Champagne Beach is called such because geothermal bubbling volcanic vents come up from the floor of the Caribbean Sea making it look like you are swimming in a champagne flute. Nice snorkeling site. Lots of parrotfish and wrasses. Douglas Bay (North west coast; in Tanetane, Caribbean Sea) Nice reefs to snorkel. The beach itself is rocky. Enter the water near the bridge area/white apartment bldg (Belle Hall). You have to swim north west to get to the reefs. Once you swim past the bridge you go literally five coconut trees down, then swim out left away from the shore …wacky directions I know. #1 Beach (literally it’s name; North coast, Atlantic Ocean) Accessible by short hike or 4×4. Also called Hampstead Beach because the beach lies on the Hampstead Estate. Swells present. Kids can swim in the Hampstead River which runs down to the beach. Brrrr…cold water, but refreshing. Lots of coconut trees for shade, just make sure coconuts are not directly above your head 🙂 Take a local with you. Mero Beach (South west; Mero, Caribbean Sea) . Underwater footage at Mero Connie’s Beach Bar/Restaurant and bathroom on site. Sandy beach. Kid friendly location. Purple Turtle Beach Club (North west coast; in Portsmouth, Caribbean Sea) – Restaurant/bathroom on grounds. Nice, sandy beach. Kid friendly location. Nice sheltered areas for shade. Picard Beach/Portsmouth Beach Hotel (PBH) (Northwest coast; Picard, Caribbean Sea)- on the edge of campus. Reefs to snorkel on the right side of the pier. La Flambeau Restaurant/bathrooms on site. Kid friendly location. Pointe Baptiste Beach/Red Rocks (Calibishe/Atlantic Ocean) – Nice beach. Northern end of beach good for shell collecting. Relaxing, peaceful environment. Waves can be a bit rowdy. Watch for shifting currents. Salisbury Beach (South west coast: Salisbury Village, Caribbean Sea) – Chez La Doudou French Restaurant/bathroom/East Carib Dive on the grounds. Chairs out for lounging. Bring bug spray to this beach-lots of sand flies. Secret Beach-(West coast, Picard, Caribbean Sea) a hidden cove beach on the Caribbean Sea not too far from Ross. Accessible by boat. I’ve heard you can hike to it but I’ve never done it. Nice snorkeling. Sandy beach. No facilities on site. Very private. Scott’s Head (Southern tip of the island; Soufriere, where Caribbean Sea and Atlantic Ocean merge) – Best snorkel site on the island. It is a marine reserve where no fishing is allowed. For good times, swim out to the drop off ! Toucari Bay /Reef at Toucari Beach (North west coast; Toucari Village, Caribbean Sea)- small sandy beach area on the left side of the bay. Snorkeling is along the left side of the bay. Nice reefs. A snacket is on the beach but not always open. No bathroom. Woodford Hill Beach (North east coast; near Calibishe, Atlantic Ocean)- sandy, lounging kind of beach. Good waves. No bathrooms or other facilities on site. Take a local with you.